Note: Anypoint Library is now referred to as “Anypoint Exchange”. You may see it reflected as library in some places, but moving forward will be Anypoint Exchange. I am excited to announce the release of the next set of Anypoint Templates as well as a new way to find, access and utilize them. Made up of patterns (migration, broadcast, aggregation, bi-directional synchronization and correlation), objects (such as accounts or opportunities) and endpoints (Salesforce, SAP, Siebel, Database), templates address specific use cases and provide a launch pad for integration success. Anypoint Templates help you learn how to use MuleSoft’s Anypoint Platform, leverage best practices and IP from MuleSoft, and ultimately, help you see success faster. Anypoint Templates are configurable, customizable, and extensible, making them both reusable and flexible. 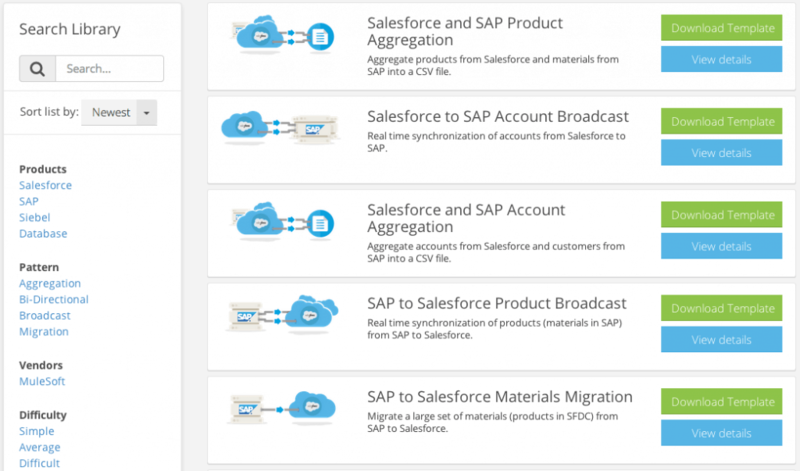 In April, we released a set of templates aimed at solving the challenge of integrating multiple instances, or orgs, of Salesforce. They helped with use cases like integrating CRM systems following a merger or acquisition, helping different department leverage their own Salesforce instances, or helping organizations share common customer information with partners. Not only have we added more templates to support more use cases and objects, we’ve also made them much easier to find, access and use with the introduction of the templates library. Visit the template library from our website or within Anypoint Studio. Browse by products, patterns, objects and degree of difficulty, and even watch demo videos, showing you how to use templates, all within the library. Within Anypoint Studio, you can easily access the full library of templates by clicking on the library button on the toolbar in the top left of Anypoint Studio. This gives you the ability to search for help, find a template for your integration projects, and get started more quickly, all without having to leave the design environment. We will be adding more templates over the coming months, so please do check back regularly to see what new solutions we have added. Also, drop us a line if you want to see specific templates or content in the library. My company will be running a project to release Microsoft Dynamic 365 X and CRM, was wondering if there are pre-existing templates for that or if there is a plan to do it?